Our Sportsman of the Week probably tends toward pitching more than hitting and now is the time to change that. 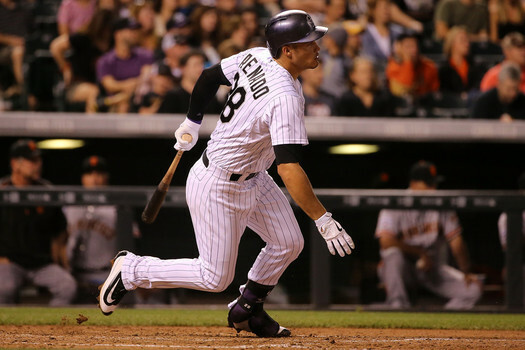 A star is burgeoning in Colorado, and his name is Nolan Arenado. In only his second full season in the big leagues, the 24-year old is quickly placing himself in the discussion of Elite. Currently leading the National League in HR (36) and RBI (106, that's 2/3 of the triple crown, you know), he's already won two Gold Gloves (a third probable this season) and been an All-Star. This week, he raked for 15 hits in 34 AB, homering in six consecutive games and knocking in 12 runs. I know it's the rare air of Colorado, but note he now has 18 HR at home, 18 on the road. Note it was 18-12 more on the road until his six at home this week. The Rockies have a future MVP to build around, he is our Longhorndave Sportsman of the Week!